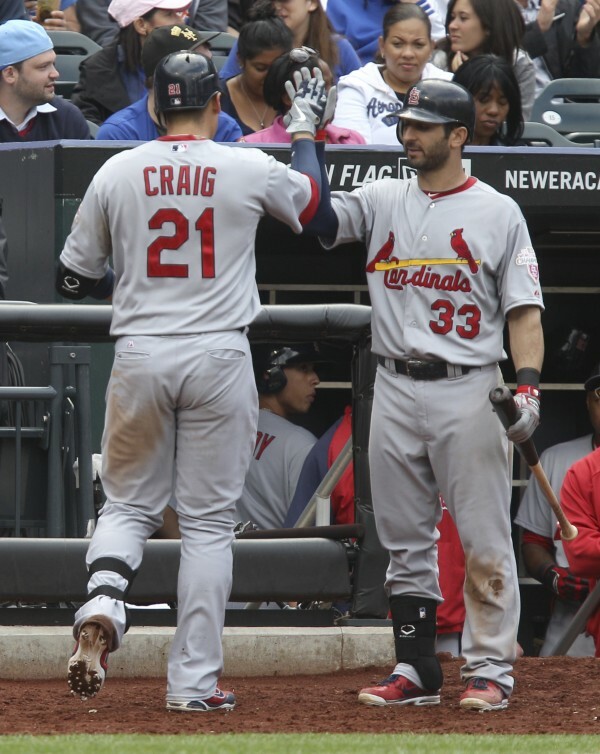 Allen Craig (left) of the St. Louis Cardinals is greeted by Daniel Descalso after hitting a two-run home run during the eighth inning against the New York Mets on Monday, June 4, 2012, at Citi Field in New York. NEW YORK — Mike Matheny tried all sorts of things to snap the Cardinals out of their hitting funk. The St. Louis manager let his players show up late to the ballpark. He gave Yadier Molina a rare chance to bat cleanup. He encouraged star Carlos Beltran to swing away at a 3-0 pitch. Not a whole lot worked, though. Not until Allen Craig provided what any struggling team will always take — a big home run. Craig hit a tiebreaking, two-run homer in the eighth inning and the Cardinals found a bit of absent pop, beating the New York Mets 5-4 Monday and stopping their season-worst losing streak at five. The Cardinals have never been swept in a four-game series in New York. The World Series champions had been outscored 19-1 by the Mets and no-hit by Johan Santana before salvaging the finale at Citi Field. St. Louis seemed headed for another rough day at the plate when five of its first seven batters struck out. All told, the Cardinals fanned 41 times in the series. Pinch hitter Scott Hairston and Lucas Duda homered for the Mets, who missed a chance to move all alone into the NL East lead. After playing the Mets on Sunday night, Matheny permitted his players to report late on a rainy morning, with most of them getting to the ballpark about two hours before game time. Craig connected one out after Matt Holliday hit a leadoff single against Jon Rauch (3-5) for a 5-3 lead. The Mets cut the deficit in the bottom half when Andres Torres hit a long sacrifice fly, but closer Jason Motte retired David Wright on an inning-ending liner to right field with a runner at third base. Dillon Gee limited the Cardinals to Craig’s RBI single before his throwing error in the seventh broke a tie game. With runners at the corners, no outs and the score 1-all, Gee gloved Daniel Descalso’s comebacker and looked Craig back to third. Gee then tried to start a double play, but bounced his throw into center field and twisted his head in disgust. The go-ahead run scored on the error, and Rafael Furcal’s RBI grounder made it 3-1. NOTES: Rauch has tenderness in his right elbow and will be checked by a doctor. He has lost five straight decisions… Wright scored his 735th run, tying the Mets record set by Jose Reyes. … Mets LHP Johan Santana will make his next start Friday night at Yankee Stadium. The Mets wanted to give him extra rest after threw a career-high 134 pitches Friday night in the team’s first no-hitter. The NL Player of the Week is keeping busy, though — he was presenting the Top Ten list on David Letterman’s “Late Show” on Monday night. … Mets RHP Chris Young, who missed most of last season because of shoulder surgery and has been in the minors this year, is ready to start Tuesday night at Washington. … OF Jason Bay (broken rib) felt ill and won’t rejoin the Mets on Tuesday, manager Terry Collins said. … Cardinals CF Shane Robinson again was out of the starting lineup. He was scratched Sunday night with a migraine. … Matheny was eager to see Monday night’s MLB draft. His son, Tate, is a CF who led his high school to the state title and is widely regarded as the best prep player in the St. Louis area. … The Mets swept a four-game series at St. Louis in 1986.